Click the image to launch the project. 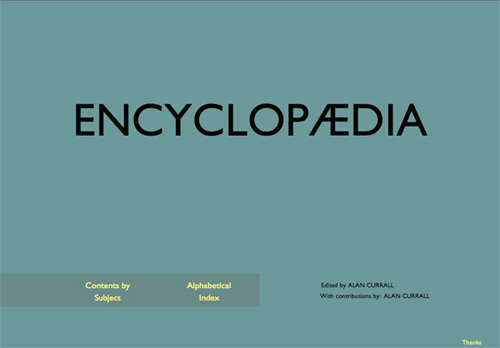 'Encyclopaedia' by Alan Currall was commissioned in 2000 by Film and Video Umbrella. It was originally published as a CD-ROM, a format that is no longer compatible with current technology. As part of Film and Video Umbrella's 25 Frames programme, the work has been faithfully replicated to resemble the original as closely as possible and to be viewed on a wide range of web browsers and tablet computers. More about 'Encyclopaedia'. More about Alan Currall. More about 25 Frames. Let us know what you think and be in with a chance to win limited edition publication 'Encyclopaedia and other works' Alan Currall, with original CD Rom. © 2013 Film and Video Umbrella. All rights reserved.